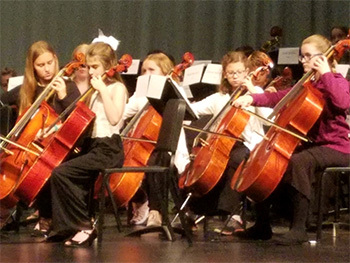 Tucson Unified School District is honored to have had three of our students represent the district at the Arizona Music Educator's Association (AMEA) Elementary All-State Orchestra on March 23, 2019. 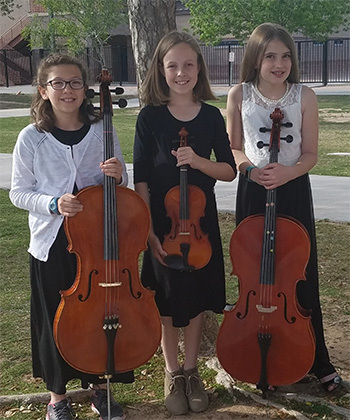 Three fifth graders from Fruchthendler Elementary School, Madeline Applegate (cello, first chair), Amelia Cabrera (cello), and Elliott Rustand (violin), represented their school and Tucson Unified at the state level. We applaud their commitment to excellence in music. This achievement also results from the dedication of their orchestra teacher Emily Evans and their private teachers. The Arizona Music Educators Association was established in 1939 as a cooperative effort of music educators. Since that time, the association has become affiliated with the National Association for Music Education (NAfME). Special interests in the Association are represented by three constituent organizations: The Arizona Band and Orchestra Directors Association (ABODA), The Arizona Choral Educators (ACE), and The Arizona Society for General Music (AzSGM). Winter Graduation - Congratulations, Graduates! Manzo Elementary - One of the Nation's Greenest Schools!